On my soapbox ~ Grocery store rant! 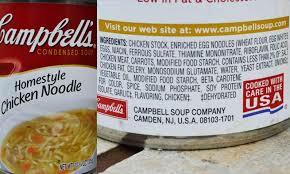 * HAVE YOU NOTICED THAT MSG IS MAKING A COMEBACK?!?! Remember not so long ago when everyone was promoting their food products at NOT containing MSG? (Or did I just imagine that?) I could have sworn that the general consensus a while ago was that we did not want MSG in our food anymore, and food processors heard us. Well, I guess I missed the memo that says it’s now okay to start putting MSG in anything and everything. For quite some time, Michael and I noticed that after we had certain things for dinner that we had a hard time sleeping because something we had eaten was making our hearts race. Certain preservatives will do that to me, and I’ve learned to avoid them. And I wasn’t buying any different products other than what I normally did, so it really didn’t make sense. So I read the ingredient labels on EVERYTHING in my pantry and freezer. Ah-HA!! Campbell’s soups (at least ALL the kinds I had on hand) ALL had MSG in them!! 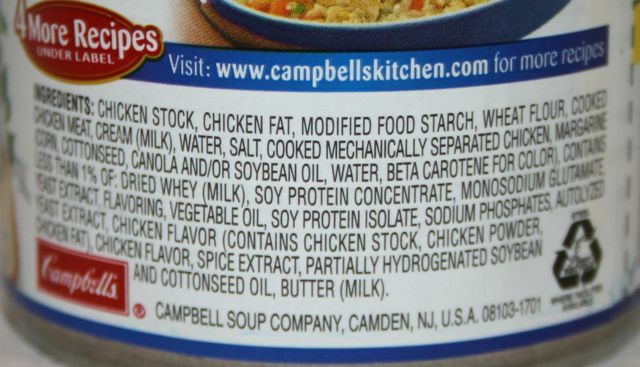 I’ve since checked nearly ALL Campbell’s soups in the grocery store and every one I checked contained MSG. A lot of Progresso soups did too. KROGER brand soups at Fred Meyer are the only ones that I’ve found withOUT MSG. I also discovered that Hamburger, chicken and tuna Helpers all had MSG. As did most of the other brands of packaged rice and noodle side dishes. ALL bottled alfredo sauces (except Newmans Own) contain MSG. A lot of the ‘foil pack spice mixes’ like taco seasoning; most have MSG in them too! READ YOUR FOOD LABELS IF YOU DON’T BELIEVE ME. You are in for quite a shock! And if it doesn’t have MSG in it, it probably has SPLENDA (sucralose, generic name) in it. Remember when the words ‘light’ or ‘lite’ on a label meant low FAT? Not anymore! Nearly every item I have looked at lately that is labeled as being light contains Splenda. And it’s in a LOT of other stuff now too, other than just light items. Just about everything that is sugar free now has Splenda in it. Even things that never contained artificial sweetners before, now have Splenda in them. “WHAT’S WRONG WITH SPLENDA?” You may ask. The commercials say it tastes like sugar because it’s made from sugar, don’t they?!? Ahhhh . . .but it’s HOW they remove the calories from that sugar that’ s the issue! They CHLORINATE IT!!! The truth is that sucralose does start off as sugar, but it is what happens after that is the problem. In the factory, three chlorine molecules are added to the sugar molecule to make sucralose. This alters the chemical structure of the sugar, making it a molecule that does not exist in nature. Because it doesn’t exist in nature, the body does not metabolize or digest this molecule. If our bodies were able to metabolize it, then sucralose would no longer have zero calories. So, HOW did I find that out? I looked it up on the intenet of course! You see, the first time I tried Splenda in a cup of hot tea, I had an instantaneous asthma attack. I have had asthma for some time now, but NEVER have I had such an instantaneous attack like I did that time. “What’s in that crap?! ?” I needed to know. As soon as I saw that it was a chlorination process they use on the sugar I knew why I had an asthma attack. I’m allergic to chlorine!!! Remember how a lot of people discovered that they had bad allergic reactions to the artificial sweetener Equal? And they had to start putting that special symbol on the FRONT label of items that contained it? I sure WISH they’d do something similar with Splenda! It’s is in foods that have NEVER before contained artificial sweeteners. Flavored coffee creamers, bottled smoothies, low calorie bottled JUICES, Ice cream, popsicles . . . Most low calorie drinks and sodas now contain Splenda. Low cal Yogurts too. So now I have to read EVERY label EVERY time I go grocery shopping because this stuff is popping up in more products every DAY. And if having to read labels to watch out for those two ‘nasty ingredients’ wasn’t enough, NOW you have to really watch the PRICING. When did ‘economy size’ and ‘family size’ labeled items start costing MORE than the regular sizes?!?!?! Now I have to PRICE COMPARE every item I buy! Sure, all that info is labeled right on the shelf, but I have to get my glasses out to read them, then look at the three different sizes, then I forget what the first price per ounce was and it just takes forever!!! And food is just too dang expensive to be spending money we don’t have to! The 12 packs of granola bars; more per ounce than the 6 pack. The family size box of Toaster Strudel (Michael HAS to have his toaster strudel!) MORE per pound than the regular size. EVEN peanut butter and Jelly for crying out loud! Just about ANY thing that comes in more than one size anymore, the larger size costs now more per measure. What the heck is up with that?!?! What about people with big families who NEED to buy the bigger sizes?!?!? This is just crazy!!! Now, of course I was not terribly thrilled ‘back when’ the small convenience sized food products cost more per unit than the bigger sizes; but at least it made SENSE! Producing and filling and packaging four smaller containers COSTS more than one big container; so the ‘added price for the sake of CONVENIENCE’ was at least justifiable. But PUNISHING those who NEED to buy in larger quantities is just plain GREEDY!! And it’s NEVER the larger sizes that are on sale. I honestly do not know WHAT I would do if I had a big family to feed and NEEDED the larger packages and KNEW that they cost more per unit than the smaller. 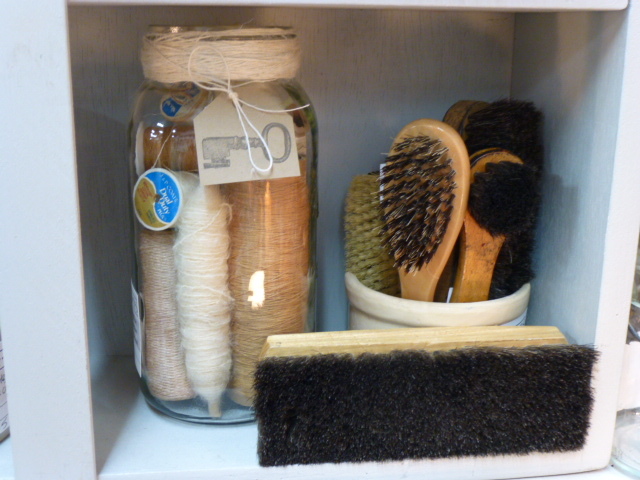 Not to even mention how much added WASTE the smaller containers contribute to! What the heck is up with this?!?!? Do manufacturers just think that no one will ever notice?? Have YOU ever noticed this?? I can’t believe that the FDA does not have stricter labeling regulations for some of these additives AND/OR that they even still ALLOW it to be put in food. But I suppose if we keep buying, regardless of what kind of CRAP they put in our food, the manufacturers will continue to get away with whatever they can. Let;s use social network to effect a POSITIVE change in the food we eat and feed our children. What’s wrong with THIS picture?!?!? I’ve sort of ‘known’ that they did ‘this kind of thing’ for years. 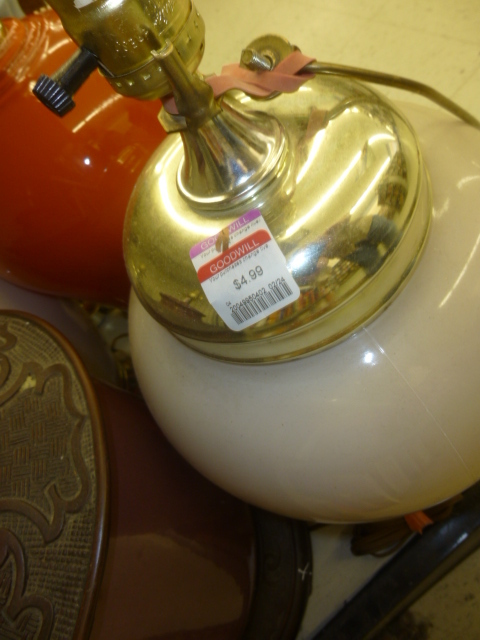 You can often see ‘several layers’ of price tags carefully place perfectly on top of each other. But to do it THIS blatantly!?!?! 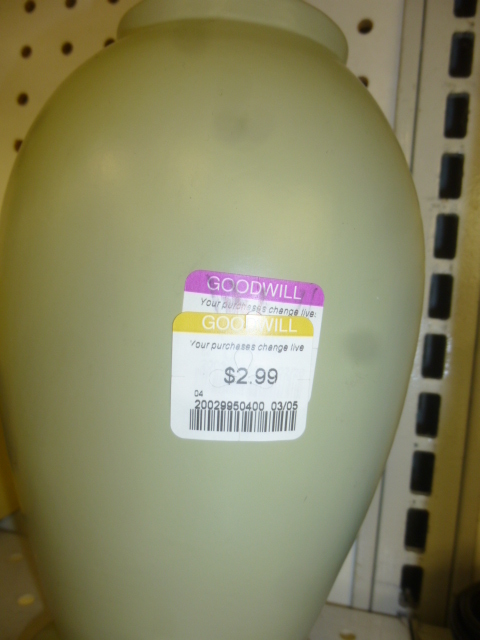 And then over the loud speaker I hear, “Goo afternoon Goodwill shoppers. Our color tag of the week is PURPLE. all items with a purple color tag are half off. And it wasn’t just that one item. There were quite a few. I really wanted to ‘call them out’ on this; especially since the purple tag is TOTALLY visible. Alas, it was late in the day and I was not feeling at all well. (recently diagnosed with plantar fasciiatis. OH JOY!) My foot just hurt so bad that I didn’t ‘have the fight in me’. But I did take pictures so I could at least BLOG SHAME them. I found it EXTRA annoying because earlier this week, at a different GW,I had been informed that they are no longer giving out reward points with their club cards. Um, Okay. Card holders will still get a small discount on purchases over a certain dollar amount; but no accumulating points and no $10.00 ‘coupon; every time you reach 500 points. I’m really quite flabbergasted at this. They are cutting back on shoppers benefits and charging us MORE (in the long run) so that they can spend more on paying employees to ‘change price tags’?!?!? Oh, and BTW, you can’t even GET their club cards anymore. They stopped issuing them after only a couple of years, but had continued to honor them. AND the cashier’s STILL ask every shopper if you have a club card?!?!? Oh you can’t get them anymore. They why do you ask everyone if the HAVE one?!?! Putting this topic to BED! I can see that you are determined to have the last word here. However, this is MY blog, so I get the last word. My first thought when I read your over-blown first comment was to just delete it and be done with you and your nonsense. Of course I don’t expect everyone to agree with me, or what I do; or like it. Unsolicited critiques are quite a different thing. While I do, oftentimes ask my blog readers for their opinions and what they think about certain projects. In this instance, I did not. You really should have quit while you were ahead. Your second comment was such a vast turn-around from you first one, that initially, I didn’t even realize it was from the same person! Now that you have confessed to being a writer, my initial inkling that you were taking this ‘destruction of books’ extremely personally, has been validated. OR perhaps a good ‘stopping point’ would have been when you professed to having discovered that ‘book altering’ HAD indeed been around for a while and IS fairly popular. You could have simply said, “I’ve never seen anything like this. It’s different, but it just does not appeal to me personally.” Instead, you made it a personal assault on me as an artist; and criticism of anyone else who could possibly appreciated this kind of thing. Nope, you kept right on going. You have an inexplicable need to be RIGHT about this, and to have the last word. Seriously??? FIVE comments on something that you don’t even CARE FOR?!?! You climbed from your soap box up to your HIGH HORSE and decided that you are now an art critic as well as an author. You pulled one very PARTIAL definition of ‘kitsch’ from your memory bank (or perhaps you did look in a dictionary) then abbreviated the definition to support YOUR personal point of view. – something of tawdry or vulgar design, appearance, or content created to appeal to popular or undiscriminating taste. – Kitsch (n.) something that appeals to popular or lowbrow taste and is often of poor quality. – Kitsch (/ˈkɪtʃ/; loanword from German) is a low-brow style of mass-produced art or design using popular or cultural icons. Also referred to as “tacky“, the term “kitsch” is generally reserved for unsubstantial or gaudy works or decoration, or works that are calculated to have popular appeal. While there were other readers/commenters who professed that they could NEVER rip apart a book as I had done; (and I absolutely respect that) they did not continue on to verbally me for what I had done; or anyone who would do so or anyone who could approve of such, as you did. 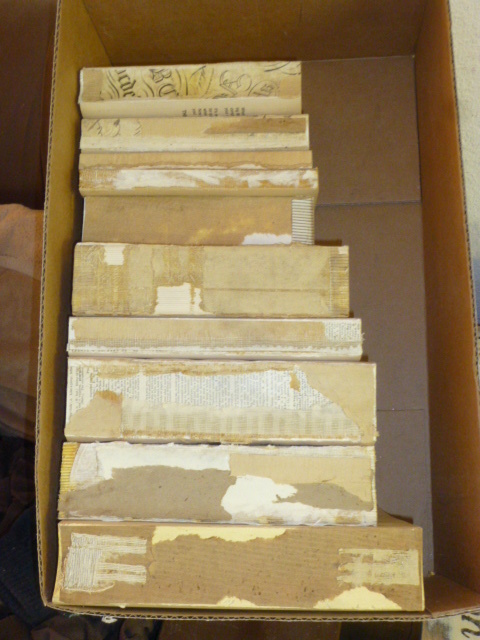 Rather, they gave me props that I was doing something to prevent these books from being obliterated in one way or another. My advice to you, ‘A Lover of Books’, is to stick to what you love and know. 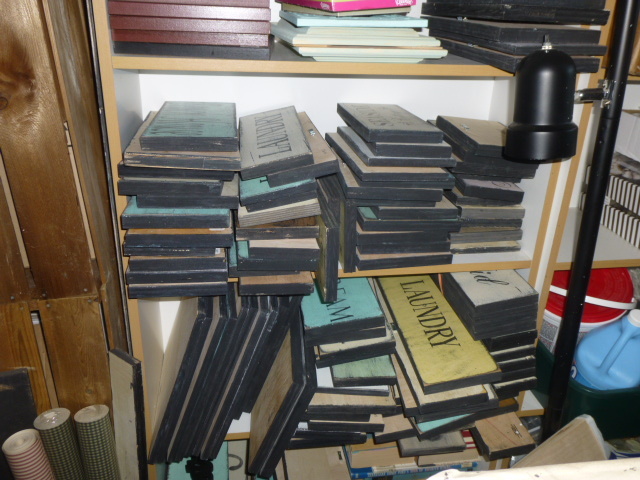 Hoard your books, continue to write whatever it is you claim to write and take your photographs. Keep you head stuck in that hole in the ground that it is apparently now stuck in and never try anything new or broaden your view. Maintain your narrow-minded view of the world, especially that of the art and craft world. Keep your soapbox handy for a leg up to your high horse. Enjoy the view from your high horse as you look down upon the lowly crafters and upcyclers of the world. Just please remember to clean up the crap that your horse leaves behind. P.S. ALL your comments have been deleted and you no longer have the ability to post comments on my blog. Horrendous; mutilated; Macabre craft project; Post apocalyptic mutilation and destruction of literature; something that looks like a skinned dog or corpse; that has lessened their faith in humanity . . . .
AND that being said, the books themselves (other than the ones that were cut down) are still entirely ‘readable’! Not MY fault that no one wants to read outdated text books, card game instructional books and old romance novels anymore. 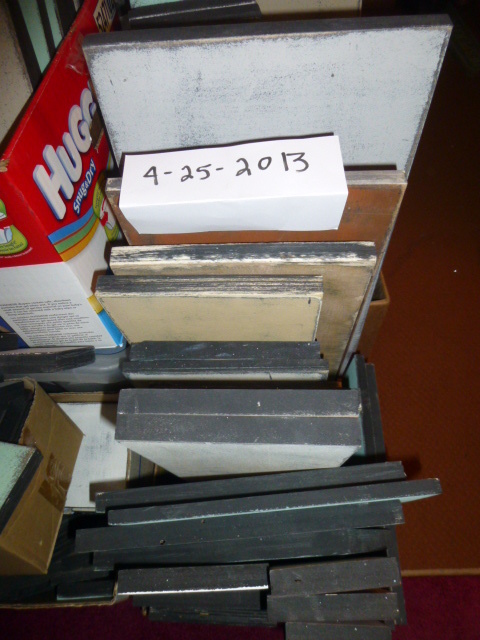 At least I have saved them from the landfill, and no criticism can demean my pride in that fact. But I guess some people really DO still judge a book by it’s cover; or lack thereof! It’s a matter of DEGREE and HOW you ask! Firstly I want to thank all of you for your comments and your understanding and encouragement. It is MOST appreciated. I’ll admit that I did delete a few comments that ‘poo-poo’d’ me for my reaction. It’s MY blog and I don’t have to post what I don’t like. Which is NOT to say that I will ONLY post comments that support me. I’m all for voicing differing opinions, but when the attack gets personal I do not have to let them use MY blog as their platform. To those of you whose comments I deleted, I did so because I don’t want this to turn into a battle. The understanding comments FAR outweigh the non-supportive ones anyhow. And those non-supportive comments obviously came from people who have not read my blog for very long. I am EXTREMELY generous in sharing my talents, tricks and ‘gift’. THAT is why it’s so bothersome to me when someone so blatantly asks for MORE; as if I don’t already give enough?!?! . I just don’t like that “GIMME! GIMMEE MORE!! !” sense of entitlement. And I did not publicly shame anyone. I SAVED her from public shame by deleting her comment with her name on it. I posted her comment completely anonymously. She chose to respond and put her name to the comment. Maybe answering those few questions COULD have been done in a few minutes. QUESTION: I am curious and I know it really isn’t any of my business, but are you making money at it now, or still building a business? QUESTION: : Mostly, how much fun are you having? QUESTION: It looks like you really enjoy “curating” your shop. Do you spend a lot of time promoting it? QUESTION: There is so much I hope you will share. Do you read about decorating? QUESTION: What does your home look like? QUESTION: Are there areas you consider branching into? Do you HONESTLY think that that would have been the end of it?? The comment that was the RED FLAG to me was “there is so much I hope you will share”. She’d be asking why or why NOT and for MORE details regarding ALL of my answers. I’m sorry if it sounds snooty or unfriendly or stingy . . but I do not have time to share ‘one on one’ like that just to satisfy one persons curiosity. Besides, if she REALLY read my blog, she’d already have the answers to most of those questions. I don’t talk about my permanent disability very much, but the fact of the matter is that with only 50% of my spine being functional, it takes me twice as long to get half as much done. (that’s 4x harder than a ‘normal’ person) That isn’t a complaint. It’s simply the reality that I live with every day, and it does limit how much I can do for myself and for others. As for the question one of them asked, “WHY would I be upset that someone asked me for advice on decorating their bathroom?” If you didn’t read the original post and don’t know the WHOLE story, you have no business commenting on it. Like I said, I get ‘odd comments / requests’ similar to that ALL the time. Every so often my patience with such lack of common courtesy boils over and I need to vent. I understand that YOUR (all my readers) perspective is limited to just the ones I share, so I completely understand your encouraging me to take it as a compliment and let the rest go. I’m working on doing just that. And maybe I SHOULDN’T share these things publicly on my blog. But sometimes I really DO need the perspective of others to help me keep MY perspective. If I gave my personal time to EVERYONE who writes and asks for it, I’d no longer have time to write my blog! Where does one ‘draw the line’ when it comes to sharing the ‘secrets of their success’ and helping others find similar success? I’ve started and stopped this same post at least a dozen times. ONE of those times I think I actually DID follow through and post it and ask for your thoughts on whether you thought I was ‘being stingy with my talents and sharing of information’ OR if a certain person was simply asking TOO MUCH of me, and for FREE. I REALLY struggle with this, probably MORE than you can imagine. And the ‘line’ is so nebulous. I can’t really TELL you where the line is. But I can sure FEEL it, when someone crosses it. I find your spaces very inspiring. Both for home decorating and for something I might want to do later in my life. I am curious and I know it really isn’t any of my business, but are you making money at it now, or still building a business? I know the rental on your spaces is spendy, but there are so many benefits to having a space rather than an actual shop. Mostly, how much fun are you having? It looks like you really enjoy “curating” your shop. Do you spend a lot of time promoting it? There is so much I hope you will share. Do you read about decorating? What does your home look like? Are there areas you consider branching into? I enjoy your blog. I keep it on Feedly. Should I just ‘accept the compliment’ and ignore the rest of it? Should I feel obligated to share the requested info with this person? Am I being stingy if I DON’T share the requested info? THIS is one of those times when I feel someone has really ‘crossed the line’. I feel . . . somehow . . . violated by how much personal info they have so flippantly asked for. They say they know that it really isn’t any of their business, but do they REALLY know that??? Or are they just padding their requests a bit in hopes that I will feel obligated to share more. And the thing IS, I really and truly do not mind answering questions from my blog readers. I really don’t. Asking how I did this or where to buy that or what is the name of that color; I don’t mind! But asking for a blow by blow accounting of how I spend my time and money is just over the line! I think the last one that sent me to my soapbox was someone who wanted decorating advice for a bathroom. A complete STRANGER to me, sincerely believed that I would and SHOULD, privately consult with her on how to redecorate her bathroom?!?! The thing is, if it was someone I KNEW, who lived close enough for me to actually GO to their house, I wouldn’t mind at all! Is that hypocritical of me?? Does the anonymity of the internet just make it TOO easy to approach a complete stranger with such requests? I sincerely feel that I am more than generous in what I share in my blog. What makes ‘some people’ feel that they are entitled to MORE?!?!? I’m just befuddled. Totally befuddled! Dear etsy, HERE’S your sign! Please pardon this post and all the annoying superfluous pictures of equipment and piles of wood. etsy has ‘requested’ that I provide them with PROOF that “I” hand make the signs that I sell in my etsy shop. I sent them links to the several posts in my blog where I show and tell how I make my signs, but that was not good enough for etsy. Nope. I am required to take CURRENT step by step pictures; and those pictures MUST include a piece of paper with the date on it. I really couldn’t think of an easier way to ‘show and explain’ to etsy my sign making process from start to finnish other than posting it here in my blog. I wonder HOW other etsy sellers do it when they are questioned about their hand mades??? Far too many photos and details to be able to just attach pictures to an email!! Paint brushes used to paint sign surfaces. 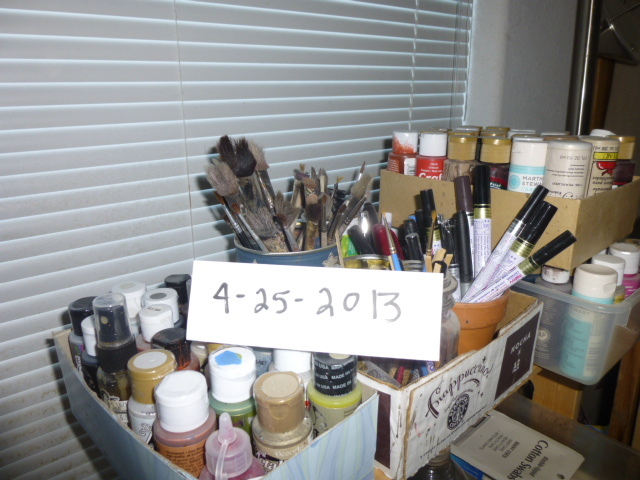 MORE paint brushes and paints. Yep! 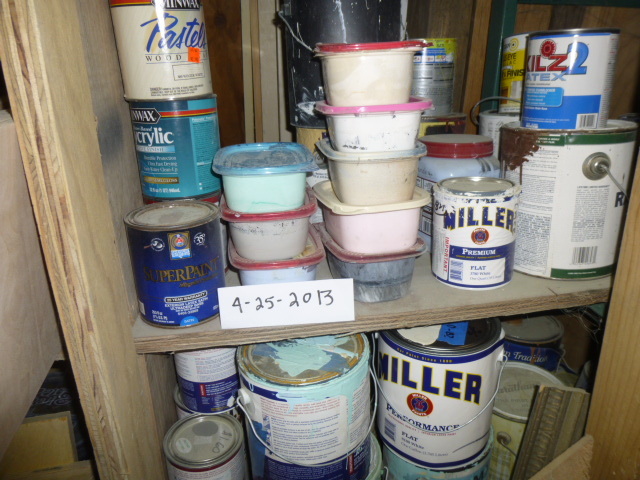 I buy my much of my paint by the gallon. 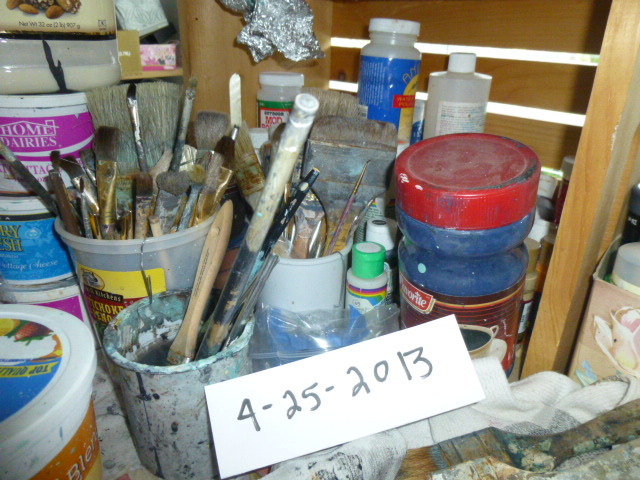 And mix some of my own colors in smaller containers. 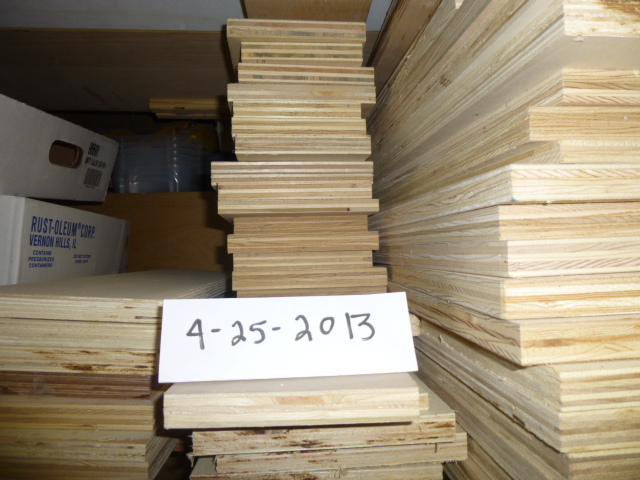 Stacks of wood for sign making. And still MORE wood. 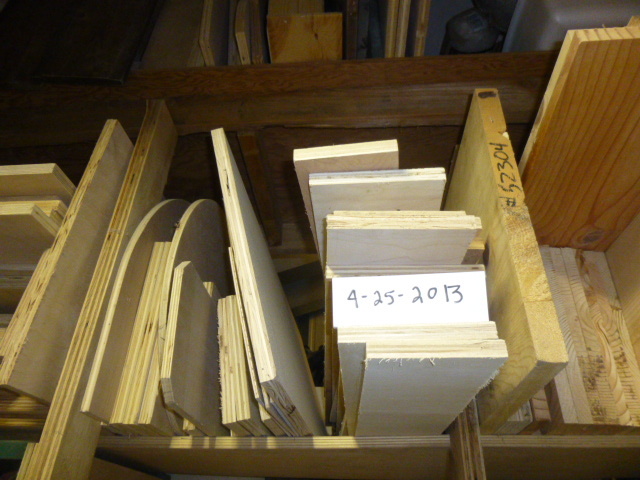 The wood I use is ‘reclaimed’ (stuff that other people were going to throw away!) So I get as much as I can, whenever it’s available. 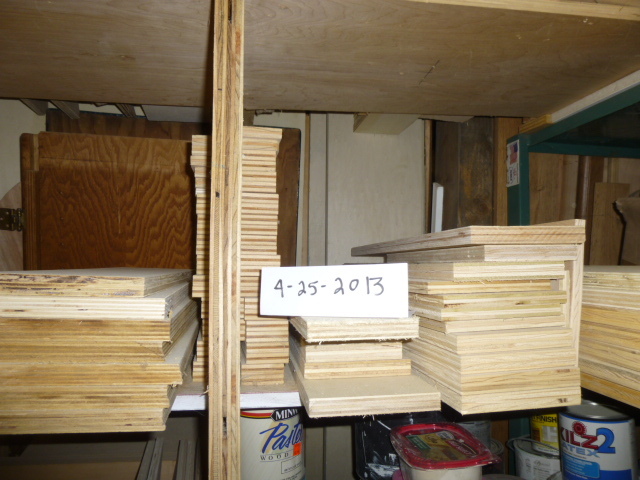 When I get into ‘sign production mode’, I can easily use up two big stacks of wood in a weeks time. 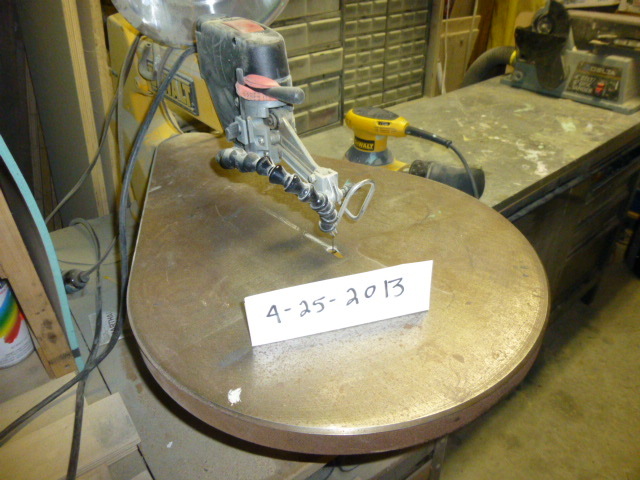 This is my scroll saw that I cut sign boards to length with. 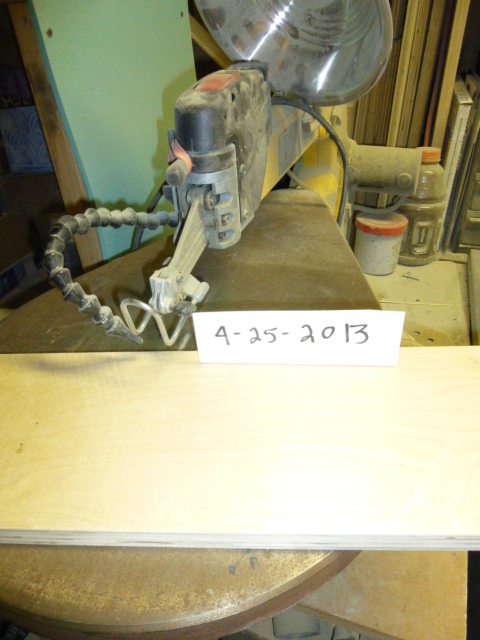 And this is how I position the wood for cutting. Sorry, I don’t have enough arms and hands to be able to take a picture of me doing the actual cutting AND take a picture at the same time. 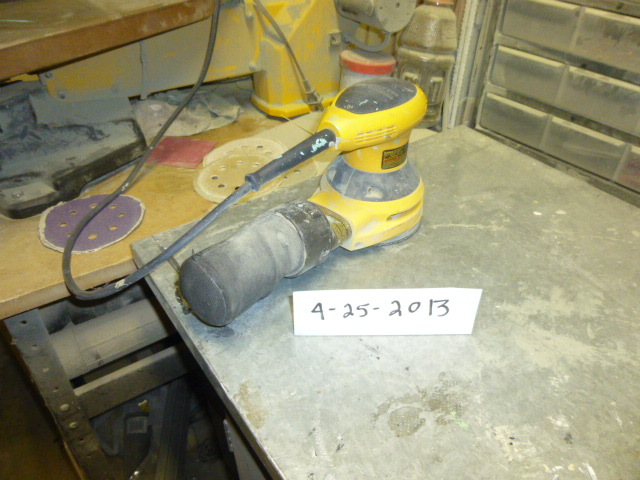 This is my 4″ belt sander that I use to sand the edges and surfaces of the sign boards before I paint them. 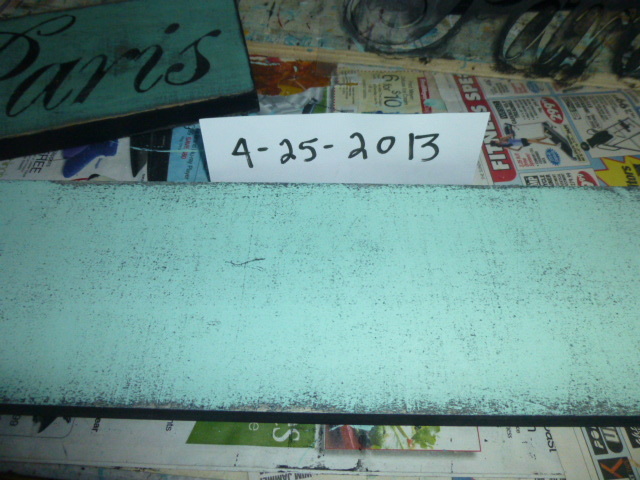 After the black base coat is dry, I paint the top coat color and let it dry. 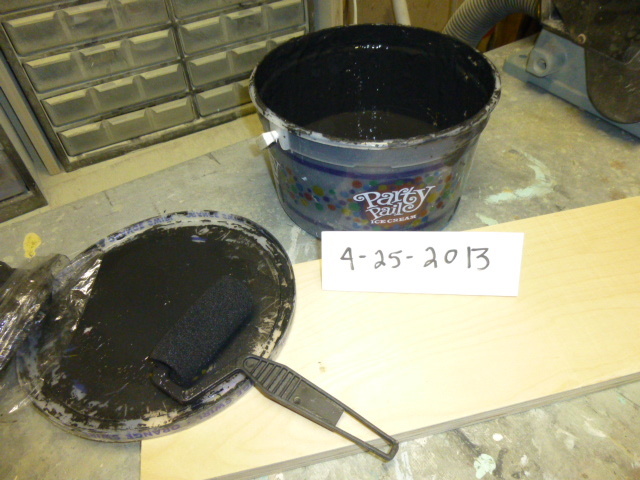 After the color top coat dries I use this orbital hand sander to ‘distress’ the sign; by sanding off some of the topcoat and allowing areas of the black base coat to show through. 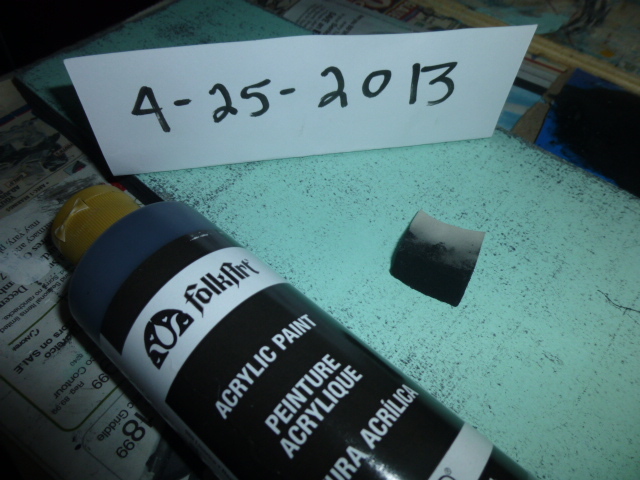 Then I go to my file of stencils and select the file that contains the stencil that I need for that particular sign. I probalby have 50 or 60 stencils in my current sign making repertoire. 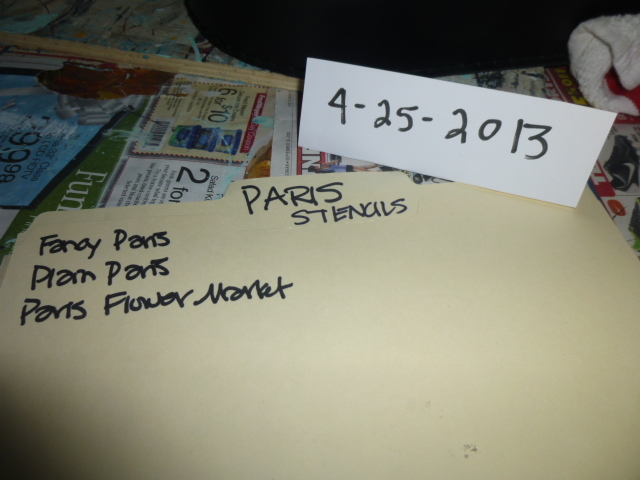 I keep them in file folderds of 2-4 stencils each; grouping similar themes together for easy identification. 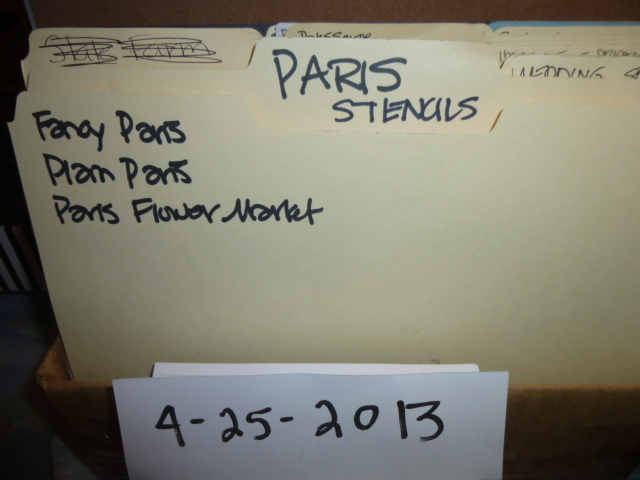 This is the file that contains the “Paris” stencil used to make the specific sign you inquired about. 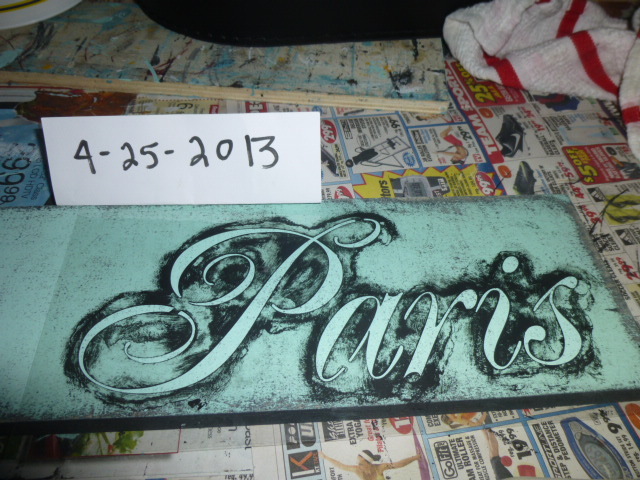 I also have other PARIS stencils in different fonts. I position the stencil on the painted and dsitressed sign board, applying some blue painters tape to the egdes to hold it in place. Using acrylic paint and a small sponge applicator, the paint is gently and carefully ‘dabbed’ over the cut out parts of the stencil. 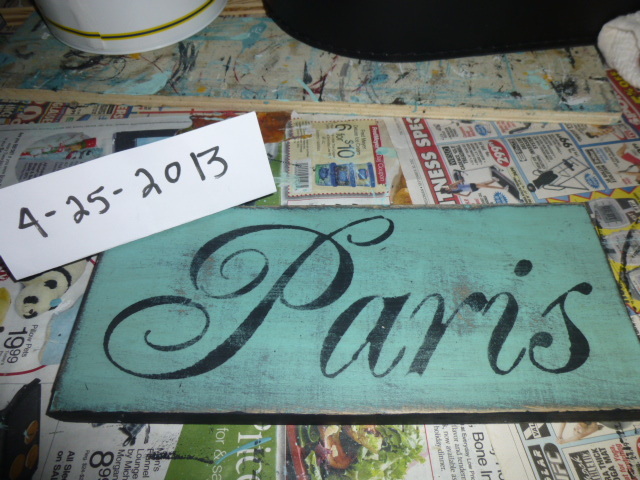 After the stenciled on lettering dries, I use a very fine paint brush to touch up any details that need it. Let that dry, then I apply a coat of matte varnsih and let it dry. (no picture of varnish drying either!) 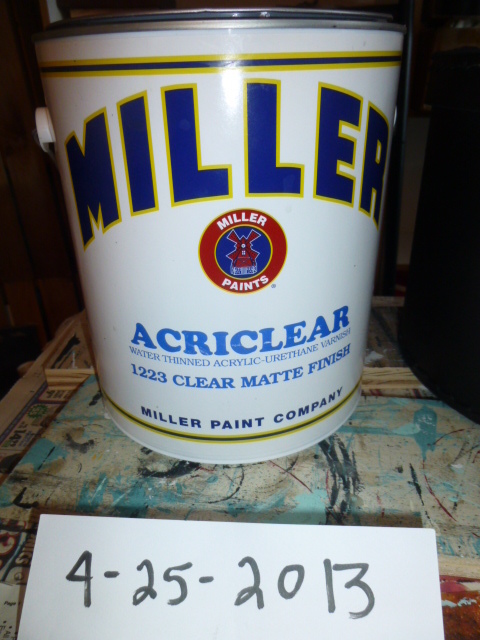 And yes I DO buy my varnish by the gallon too. (undated stock photo) After I apply the varnish I put the paint brush I used to apply the varnish in a jar of water to soak. 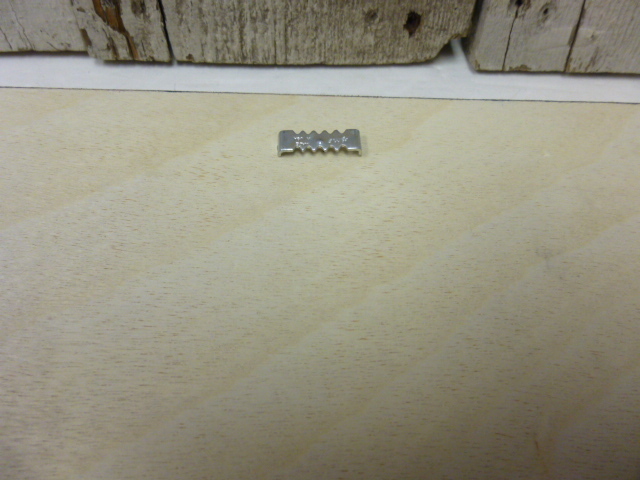 Then I use a hammer to attach a ‘nailless sawtooth hanger’ to the back of the sign. But in reality, I NEVER make just ‘one sign’ at any given time. To maximize my productivity I work in a modified assembly line manner. 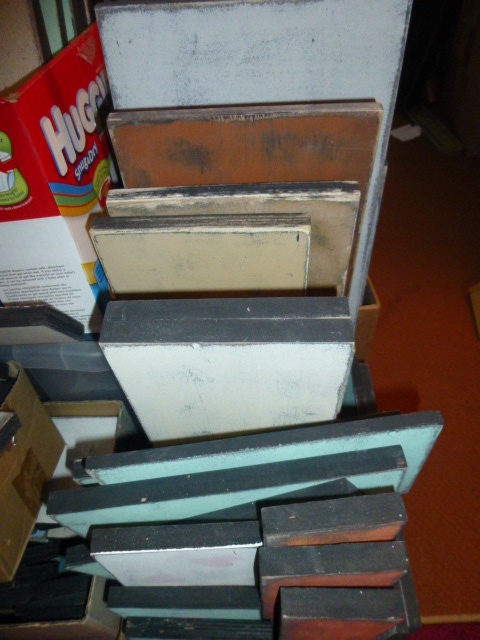 Some days I’ll do nothing but sand a couple of piles of sign boards. Then the next day I’ll paint them all with the black basecoat, and leave them out to dry. Then the next day I’ll paint them all with the topcoat color, and leave them out to dry. 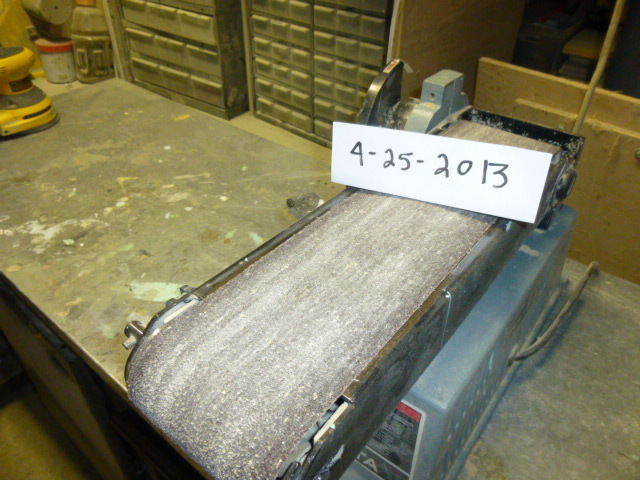 Then the next day, I’ll hand sand and distress that same batch. 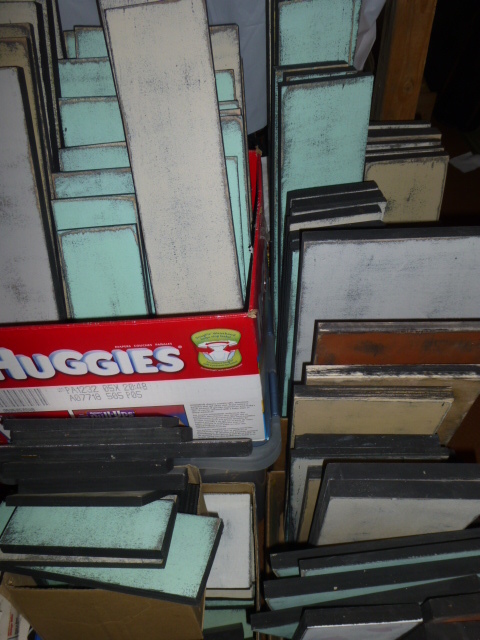 Then after all that is done, I store those stacks of ‘ready to stencil’ boards in my craft room. Sorry ! I forgot my ‘date card’ on this picture! Having a lot of boards prepped and ready to stencil really streamlines the whole process for me, and cuts down on the actual amount of time I ultimately spend on each sign. Predominately set up and clean up time. 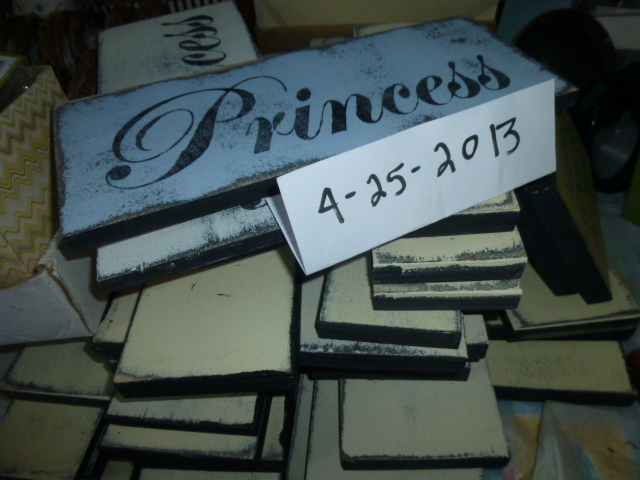 And by having a multitude of boards ‘prepped and ready to paint’ when I get a request for a custom color of a certain sign; I am able to go ahead and make a whole BATCH of that particular sign, in several colors; and stock up my etsy shop. It doesn’t take any more TIME and effort to clean a stencil that was used to make six signs that it does to clean it after making just one sign; so why not MAKE MORE and WASTE LESS TIME ON CLEAN UP. Same goes for paint brushes. So, etsy, does THAT clear up any suspicions you may have had that I am not hand crafting my signs myself?? It sure would be nice if etsy would give sellers ‘some kind of recognition’ for having gone through this tedious process of proving they hand make their items. Perhaps even a simple notation of some kind that this particular item has been individually vetted by etsy would be nice. So, now that etsy has seen waht they need to see, I can explain why all this REALLY ‘gets my goat’! And it’s not that I minded having to PROVE that my items are hand made by me. What is so annoying is the sales of ILLEGAL licensed designs is absolutely rampant on etsy, and they DO NOTHING about it. The ONLY time they will question a seller of such items is IF the holder of the license of that design (Disney, Sports Teams, Barbie, Hello Kitty, spongeBob . . .there are THOUSANDS of them) complains. Because that is ‘all the law requires. BUT, if one person, ANY one person, contacts to etsy and says “I don’t think that person hand-made that item.” A full-blown investigation is launched. And they require you to show every single step in the process and every single tool and piece of equipment used. (as you can tell from my post!) It’s a LOT of work, let me tell you. And ALL it would take for them to validate someone selling licensed designs is to have them show their ‘credentials’. And it HIGHLY unlikely that ANY of those sellers actually DO have permission. It costs a LOT of money to ‘buy’ that permission. If they could afford to legally acquire permission to sell a licensed design, they wouldn’t NEED to sell on etsy! It’s the ‘turning a blind eye’ to illegally sold items on etsy that really annoys me about this whole situation! It’s perfectly okay to sell ILLEGAL products, but don’t you dare sell a hand-made item that bares any resemblance to something that is manufactured! Stepping off my soapbox ! 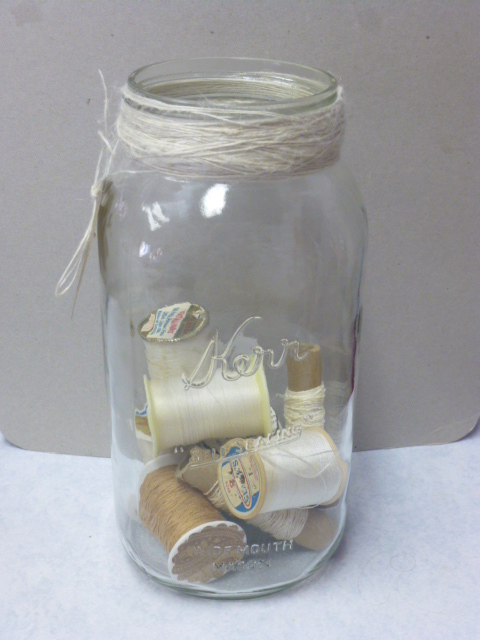 Grrrrrrrrrrrrrrrrr . . . .
See the big glass jar filled with vintage spools of thread? And this is what was left of it the last time I went it. Not only did someone empty the jar and help themselves to the bigger spools that they wanted. They actually dumped the rest of them on the floor and put the empty jar back on the shelf?!?!? One thoughtless person sure can ruin your whole week! Anxious to get back in to my booth later this week to see how much has sold, now that I’ve got everything at 40% off in order to scale back down to the one space. For those of you whom have never met me in person, I’m pretty ‘animated’ when I speak. In person when I want to emphasize something I am saying I can use voice inflections, facial expressions and physical posturing. In writing, I feel compelled to emphasize the same words and phrases that I would if I were speaking; and the way I happen to do that MOST of the time, is to use capital letters. While here in my blog, I have several other options for emphasizing words, italics, bold, underline and even different colors! And I admit that I don’t use those features as often as I should. Probably because I’m just not a very good typist, and those things take extra time! But, also it’s a bit distracting and interrupts the flow of writing to pause to hit the bold button, then to click it again to stop. It’s just EASIER to capitalize and occasional word that I want to emphasize; or put it in parenthesis. Back when instant messaging came into the world, all of a sudden we needed ‘etiquette rules ‘for such; and it was decided that when you type using all capital letters that you are YELLING. Okay, that’s reasonable. But now all of a sudden, SOME people who have deemed themselves the internet etiquette police, have decided that if you use ANY capital letters that you are yelling?!?!? And more than once I have been accused of yelling when I capitalized a word here and there. IN my reply to her I covered all my bases, as I’ve become accustomed to doing in such instances BECAUSE if I don’t, I’ll end up with a bunch more annoying convos with more questions in the aftermath. Both items (actually 8 items in 2 groups of four) would NOT have fit into such a box, AND left enough room for adequate packing materials to prevent breakage in transit; which I explained to her. I went on to explain that IF I forced them into too small of a box with not enough packing material, even IF I insured it; that the PO has the right to inspect the shipping boxes and packing materials used and COULD determine that the breakage was MY fault for insufficient packing. In which case I’d be out all that money. And I’m not willing to take that chance. And even WITH as careful as I always package my items for shipping, that I’ve had three things get broken in transit in less than a year. So I just don’t push my luck with things like this. I further explained that I always only charge exactly what it costs me to ship; whether on single or combined orders, and will always refund any shipping overages paid of $1.00 or more. And I wrote all this, just as I ALWAYS write; capitalizing a word here or there that I wanted to emphasize. I’m sure some etsy shoppers don’t understand, but I sold & shipped on ebay for years & never had a fragile item break. By the way, you do realize that using all CAPS is the equivalent of shouting at the other person? So, after being talked down to & shouted at, never mind. It doesn’t REALLY bother me. I actually feel like I dodged a bullet by NOT getting her as a customer! She obviously does not have much of a grasp on reality. SHE’S never had a fragile item break, she tells me. So does that mean that NO ONE has ever had an item get broken in shipping?!?!? I totally don’t understand her reason for THAT remark. Does it mean she is willing to risk minimal packaging to get cheaper shipping and she won’t care if it happens to break???? Anyhow, back on track to the etiquette question. Do YOU feel like I am shouting when I emphasize words with capital letters in my blog, as I’m quite inclined to do on a regular basis? Or do you ‘get’ that I am just typing like I talk, putting more emphasis on certain words? OR did I miss a recent memo regarding internet etiquette, and ANY use of capital letters is considered shouting??? P.S. I feel like I am spending an inordinate amount of time on my soap box lately?!?!? Is it just a coincidence, or am I just getting OLD & CRANKY?! ?